"[A] luminous tale of passion and betrayal" set in the post-colonial and civil war eras of Sierra Leone (The New York Times). As a decade of civil war and political unrest comes to a devastating close, three men must reconcile themselves to their own fate and the fate of their broken nation. For Elias Cole, this means reflecting on his time as a young scholar in 1969 and the affair that defined his life. For Adrian Lockheart, it means listening to Elias's tale and following his own heart into a heated romance. For Elias's doctor, Kai Mansaray, it's desperately battling his nightmares by trying to heal his patients. As each man's story becomes inexorably bound with the others', they discover that they are connected not only by their shared heritage, pain, and shame, but also by one remarkable woman. 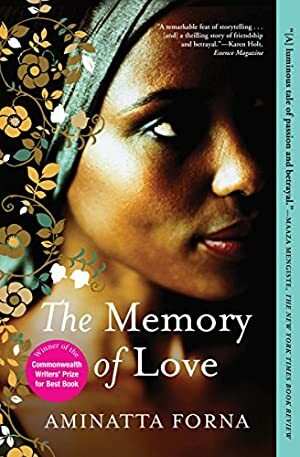 The Memory of Love is a beautiful and ambitious exploration of the influence history can have on generations, and the shared cultural burdens that each of us inevitably face. Log In to track Aminatta Forna on eReaderIQ. to be notified each time the price drops on any book by Aminatta Forna. to stop tracking Aminatta Forna. We started tracking this book on January 18, 2012. The price of this book has changed 164 times in the past 2,648 days. The current price of this book is $8.54 last checked 23 minutes ago. The lowest price to date was $1.20 last reached on June 21, 2018. The highest price to date was $9.99 last reached on January 15, 2019. This book has been $9.99 45 times since we started tracking it. We last verified the price of this book about 23 minutes ago. At that time, the price was $8.54. This price is subject to change. The price displayed on the Amazon.com website at the time of purchase is the price you will pay for this book. Please confirm the price before making any purchases.